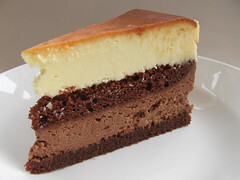 Dark and White Chocolate Cheesecake - Do You Know The Muffin Man? Notes: First, a note about pans: the recipes call for a 9" round cake pan, but I went ahead with 8" ones. The devil's food cake was easy, but I didn't mix the eggs in very well, so I had to pick out a chunk of cooked egg white from the baked cake! I made the white chocolate batter first, then the dark chocolate, as it makes more sense that way if you have one mixing bowl. The assembled cake filled my 8" round pan (with 3" sides) all the way to the top. Fortunately, during baking, it rose over the edge but didn't spill over. The top is deeply browned even though Malgieri says to bake until it colours slightly, as I wanted to make sure the cheesecake was cooked through (total baking time was almost 90 minutes). Despite the attractive appearance, I found this to be a bit plain. There are no flavourings in the batter; amaretto cream would be nice in the white chocolate, and Kahlua in the dark. Still, an interesting variation that allows you to bake two layers at the same time.